Although the island of Tenerife is a holiday destination and has subtropical sunshine all year round it has noticeable seasons just like elsewhere in colder climates. Winter is the time when Mother Nature's rains have had a chance to put new growth into many of the plants and trees and whilst some types stay dormant and drop their leaves others really come into their best with glorious floral displays. "Yellow is the colour" goes an old song by Donovan, and the singer was talking about the shade of his true love's hair but here on Tenerife, it is the main colour for many flowers that bloom in winter. I always think that the yellows and golden hues are to remind us that the days are getting longer and we have more sunlight each day. In Britain the spring flowers are often yellow too with daffodils and celandines and golden crocuses. Here in Tenerife it's like having a very early spring but with summer temperatures at times and yet it is still possible to have snow on Mt Teide. Looking at deciduous trees like the Canary Island Willow and the Plane that drop their leaves, as do grape vines it looks more like autumn is here as well. Tenerife has elements of all the seasons at the same time. I took a walk down from the village of San Juan del Reparo to Icod de los Vinos taking note of all the yellow flowers I saw on the way and with a snow-dusted view of Teide in the distance towering over the valley. Golden Gorse just like that which grows on mountains and moor lands in Britain is doing well on many parts of northern Tenerife, where it grows along with Tree Heather, brambles, bracken and other ferns. Seeing these plants really reminds you of the United Kingdom, except that the heather there is minute in comparison with the massive varieties that grow here. 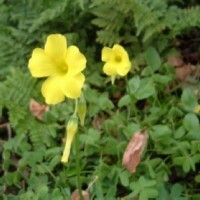 The Bermuda Buttercup with its leaves like shamrock was one I encountered at the roadside and on waste ground. This cheery bright yellow flower is not a native and is classed as an invasive weed because it spreads so fast but the carpet of colour it gives looks wonderful at this time of year. The Canary Island Sow-thistles are also starting to flower now and some species look like giant dandelions with their large jagged leaves and yellow flower heads. These plants have been made use of in traditional Canarian herbal medicine to treat fevers, blood pressure, migraine and other ailments. One of the types of houseleek looks at its most spectacular in winter with its golden starry flowers on inflorescences above the fleshy rosettes below. The Golden Houseleek grows on rocky ground and even on the roofs of houses, as its name suggests. The houseleeks are also used as herbal remedies. The Golden Cup vine has huge flowers and big leaves too and makes an incredible display as it rambles over walls and fences. Adding a splash of other colours are the red and pink geraniums in gardens and borders and the Bougainvilleas are in full bloom now too creating vast clouds of purple and orange and salmon pink as they ramble over walls and whatever they can climb over. White and cream huge Angel's Trumpet flowers hang off the small trees and bushes they grow on. This plant is a real femme fatale because beautiful as it is to look at, it contains a strong narcotic poison, and it's a case of look but you'd better not touch. There is plenty of lush greenery now too and the Canary Island Sorrel with its glossy rounded leaves and small greenish flowers can be seen on roadsides and waste ground all over the island. Apparently a few drops of juice from the leaves can clear a stuffed up nose so it could prove handy if you have caught the flu or a cold. Many of the sorrel plants I could see had holes in the leaves and on one I spotted some furry caterpillars. They would turn into Ruby Tiger Moths when they completed their life cycle. I had seen adults of this pretty moth on the island and recognised the species in its larval form too.. But I couldn't tell you what a most beautiful golden-yellow daisy-like flower is that was another rambling plant I found. I had spotted this from the bus before and had assumed it was the Canary Creeper, which is a member of the nasturtium family with yellow flowers and a climbing habit. Getting up close I could see it is very different species and despite searching through all my flower books I still haven't found out what it is, although I can tell it is a species of Senecio. I expect some day I will find out but for now I will simply enjoy its beauty. Speaking of Nasturtiums, this is another flower that is growing in profusion now. It has rounded leaves and yellow or orange flowers and the little nutty seeds can be used as a substitute for capers. The leaves and flowers can be added to salads and taste a lot like Watercress and it adds a spicy flavour. But after my long walk I felt like eating a lot more than a salad so I headed on home for my tea. Christmas in Tenerife in the Canary Islands is a colourful time of year because there are plenty of flowers like the Poinsettia in bloom as well as festive decorations.